In March, the Federal Reserve Board voted to raise interest rates for the second time this year, indicating their concern that rising wages would result in inflation if they did not take action. However, an analysis of average hourly wage trends for six sectors of employment since 2010 finds little evidence that wages are rising dangerously fast, or even accelerating at all. The overall unemployment rate fell to 4.4 percent in April, tying the lowest level reached since May of 2001 as the establishment survey reported the economy added 211,000 jobs. With roughly offsetting revisions to the prior two months' job growth, this brings the average for the last three months to 174,000. While the report on the whole is quite positive, one item is especially worth noting – the increase in the employment-to-population ratio (EPOP) among prime-age men. The employment rate for prime-age workers edged up to 78.6 percent. This is a new high for the recovery, although it is 1.7 percentage points below the pre-recession peak and 3.3 percentage points below the 2000 peak. In April the EPOP for prime-age women edged down to 71.9 percent, 0.9 percentage points below its pre-recession peak and 3.0 percentage points below its 2000 peak. However the EPOP for prime-age men rose 0.2 percentage points to 85.4 percent. This is still 2.6 percentage points below its pre-recession peak and 4.1 percentage points below its 2000 peak, but the rise does suggest that there is still more room for EPOPs to increase among prime-age men. The fact that the EPOP for both prime-age men and women remain below pre-recession levels and far below 2000 levels strongly suggest that the issue is a lack of demand in the economy and not a decrease in the ability or desire of people to work. Earlier this month the Washington Post’s editorial board published a criticism of the Social Security Disability program. Noting the decline in labor force participation amongst prime-age men, the board suggests that the disability program discourages its recipients from working. The article argues that the sudden loss of cash benefits (and affordable health insurance) when recipients rejoin the workforce might persuade many to remain on disability when they are able to work. It seems unfair to lump these two factors together, since the program’s modest monthly benefits are far less than the wages of any near full-time job, while the loss of health insurance, especially for disabled workers who may require additional services, would be devastating. The Post is probably right to say that health insurance costs play a strong role in workers’ choices about their employment level, but that suggests a different type of reform. Dean Baker, Rebecca Vallas, Katherine Gallagher Robbins, and Rachel West have already pointed out most of the problems with Washington Post’s recent story and its subsequent editorial on Social Security Disability Insurance (SSDI). But I want to say a bit more about one aspect of how the Post’s framing of the story, and use of cherry-picked data, paints a misleading picture for the public. The story and the editorial are only the most recent of elite national media pieces promoting the idea that SSDI is a de facto unemployment assistance program for prime-age men who may be “desperate” but aren’t really disabled. Reading these stories, I imagine many readers come away with the impression there has been a large increase in the number of 30- and 40-something men who are receiving disability benefits, and that this is driving a large part of the decline in prime-age men’s labor force participation over the last two decades. President Trump has promised to release his tax plan this Wednesday, April 26. While details are lacking, one thing we can be sure of is that it will include a reduction in the tax rate on so-called ‘pass-through’ business income. Pass-through income is the net income of a business that passes through to a business’ owner or partner and is taxed at that individual’s tax rate. The income received by an individual who is the sole owner of a business like a bakery or deli after all expenses are paid is an example of pass-through income. So it is the net income of high flying partnerships that is distributed to the wealthy partners in private equity firms, hedge funds, and Wall Street law or tax accounting practices. President Trump, who is a partner in hundreds of real estate ventures and other businesses, receives pass-through income. Last month the Congressional Budget Office (CBO) announced that the (now defunct) American Health Care Act (AHCA) would have reduced off-budget spending by $5.9 billion in 2026. Off-budget spending, otherwise known as Social Security, isn’t mentioned in the bill once, so how could the AHCA affect its spending? The answer is that the bill, in CBO’s assessment, would have discouraged older workers from retiring or moving to part-time work and starting to collect Social Security benefits. Under the Affordable Care Act, workers have the flexibility to obtain health insurance from the exchanges instead of relying on employer-provided plans. Without it, we can infer that CBO’s projected savings came as the result of 500,000 older workers delaying their retirement, and therefore not collecting Social Security benefits in 2026. The unemployment rate fell to 4.5 percent in March, its lowest level since May of 2007. The employment-to-population ratio also edged up to 60.1 percent, a new high for the recovery, but still more than 3.0 percentage points below its pre-recession level. However, the good news on the household survey was accompanied by weak job growth in the establishment survey. The economy added just 98,000 jobs in March. Job growth was also revised downward by 38,000 for the prior two months, bringing the three month average to 178,000. There also has been some shortening of the average workweek. The index of aggregate weekly hours is unchanged from its January level. The strongest areas of job growth were restaurants (21,700), building support services (16,800), and health care (13,500). Mining also added 11,000 jobs, as did manufacturing. Retail was a big job loser in the month, shedding 29,700 jobs. This sector is likely to continue to show weakness as several major chains have announced plans to close a large number of stores. Wage growth appears to be slowing slightly. While the year-over-year increase in the average hourly wage was 2.7 percent, wages have grown at just 2.4 percent comparing the average of the last three months to the prior three months. This should give pause to those concerned about the labor market being too strong. The fall in the length of the workweek, coupled with modest wage growth, indicates there is much room for further strengthening. 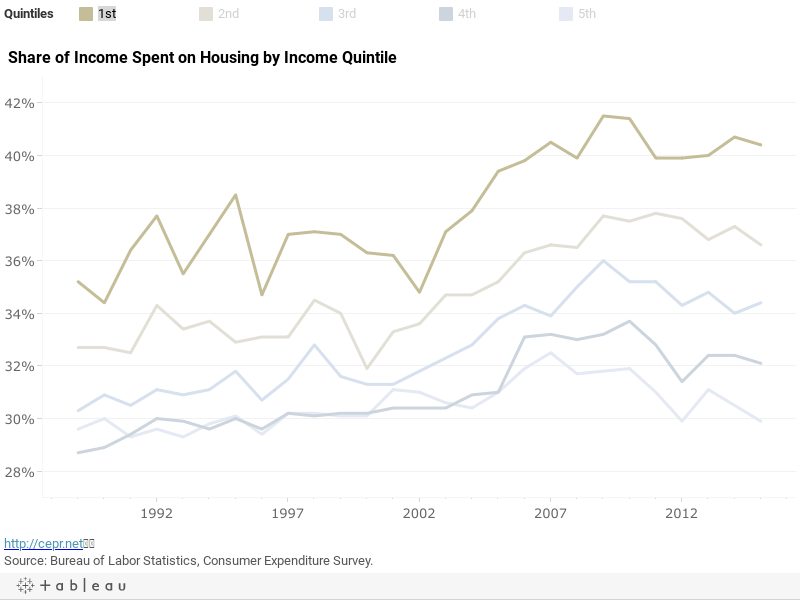 Data from the Consumer Expenditure Survey show that the bottom 60 percent of the US population has been spending over 30 percent of their income on housing since before 1989. In 1981, the Department of Housing and Urban Development (HUD) issued a recommendation that a maximum of 30 percent of household spending go to housing costs. This clearly has not been the norm for most households over the last three decades. For the lowest income quintile (with an average income of $10,916 in 2015), rising housing costs are an especially large burden, averaging over 40 percent of income spent on housing each year since 2007. At the other end of the income spectrum, the top income group (average income of $177,851 in 2015) spent more than recommended on housing for a majority of the years analyzed, although the most recent numbers are back below 30 percent. Unemployment rates for black workers continue to be well above those of white workers – within any given age group, the black unemployment rate is often double the white unemployment rate. In addition to being much higher, black workers’ experiences with unemployment are typically different from white workers’ unemployment experiences. This post analyzes unemployment data from 2016 to gain some insights into the nuances of black unemployment – underemployment, length of unemployment, and causes of unemployment. For context from previous years, see this 2015 CEPR post on racial inequalities in unemployment. Tuesday night, Rachel Maddow and David Cay Johnston revealed Donald Trump's 2005 two-page Form 1040 on air. Before revealing the form, Maddow made an extended argument that Donald Trump must release his complete tax returns in order to disclose all potential conflicts of interest from his business empire, including potentially income from foreign governments. We agree — but tax returns are merely a starting point for understanding Trump’s business partners. In one example, Maddow pointed to a sketchy real estate deal with a Russian oligarch. Donald Trump purchased a piece of property in Florida for $40 million in 2005. Just three years later, Trump sold the property for $100 million to a Russian oligarch (i.e., a rich Russian businessperson closely tied to Putin’s government) named Dmitry Rybolovlev. Trump's 150% return on investment in just three years would be suspiciously large even if the real estate magnate had bought an undervalued property and improved it. However, Rybolovlev actually quickly tore down the 62,000 square foot mansion and sold it off in three pieces. How the value of the property appreciated so quickly is a mystery, especially as the Florida’s real estate market was collapsing. The employment rate for prime-age workers (ages 25-54) inched up to 78.3 percent in February, a new high for the recovery, as the economy added 235,000 jobs. This is 0.5 percentage points above its year-ago level. Most of the rise has been among women, with an increase in the prime-age employment-to-population ratio (EPOP) of 0.8 percentage points to 71.6 percent over the last year. The rise among men over this period has been just 0.2 percentage points. 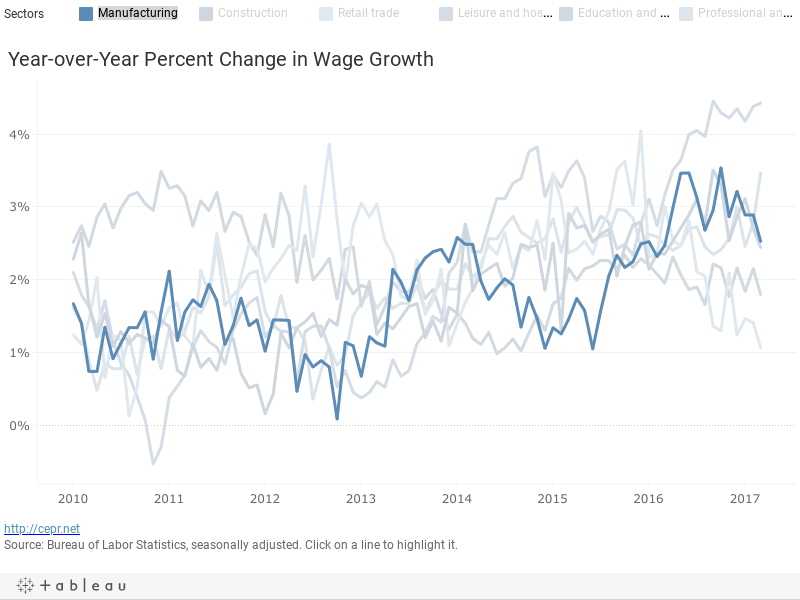 This rise is noteworthy since it suggests that there are more workers being pulled into the labor force as the recovery continues, even as the unemployment rate has remained relatively stable. If this trend continues, it indicates that the labor market can continue to tighten without creating inflationary pressure. Guidelines from the Department of Housing and Urban Development recommend that households spend no more than 30 percent of their income on housing. The reality, however, is that over half of U. S. households spend more than that. A burden which the department notes can cause households to struggle to afford “necessities such as food, clothing, transportation and medical care”. CEPR compared Fair Market Rent for a one-bedroom appartment in some of the U.S.’s largest metropolitan areas to monthly income based on each city’s minimum wage to get a more accurate picture of housing costs for the majority of the population. Unsurprisingly, San Francisco, CA wins as the “most unaffordable” city to live in based on this data analysis. One month of full-time minimum wage work at $13 an hour would net the worker $2,080 and their fair market rent would be $2,411, or 116 percent of their monthly income. This disparity puts San Francisco a full 30 percentage points above second-place contender, Philadelphia. At the opposite end of the spectrum, full-time minimum wage workers in Dallas, TX earn $1,160 at $7.25 per hour and pay 41 percent of it, $679, in fair market rent. This is the lowest percentage of any of the cities analyzed, although it is still well above the 30 percent federal guideline. In 2010 Wisconsin elected Scott Walker as governor, a conservative Republican. At this time, Republicans also controlled both houses of Wisconsin’s legislature. Neighboring state Minnesota elected Mark Dayton, a liberal Democrat. Democrats also controlled both houses of Minnesota’s legislature. Both governors were re-elected in 2014. The two governors took their states on diametrically opposed courses. Walker cut taxes and paid for them with cuts to spending in education and a number of other areas. He also deliberately confronted the state’s public sector unions. He prohibited contracts requiring that all the workers who benefit from a union contract pay for their representation, along with several other measures designed to weaken unions. Later he signed legislation applying the same restriction to private sector contracts. Millionaires are getting a late valentine from Social Security in 2017. The taxes that support the program — which provides retirement, disability, and survivor benefits to millions of Americans —only apply to the first $127,200 that someone makes at their job (up from $118,500 in 2016). Wage income above this $127,200 cap is not subject to the tax. So, someone who makes $1,000,000 a year would stop paying into the program on February 16th. Last summer the Center for American Progress released a report on the problems with the Unemployment Insurance (UI) system in the United States. They cited, among other things, the historically low number of jobless workers who received UI benefits in 2015 – just 27 percent. The two main criteria that determine a worker’s eligibility for benefits are the duration of their unemployment (most states cap UI at 26 weeks) and that they lost their job involuntarily. However, during severe recessions, workers may be unemployed for much longer than 26 weeks, as was the case in the recent downturn. An analysis of trends in unemployment shows that long-term unemployment is one of the main reasons for the decrease in the percentage of the unemployed receiving benefits. Are Most Working-Class Americans “Public Charges”? According to Vox and the Washington Post, the Trump Administration is considering an Executive Order that would have a profound impact on the current system of lawful, family-based immigration. To understand what’s at stake, it’s helpful to first know some of the legal and historical background. Under current law, immigrants seeking a visa to become lawful permanent residents on family-based and certain other grounds can have their applications denied if they are found “likely to become a public charge.” In very rare cases, green card holders living in the United States may be deported if they become public charges during their first five years in the United States. Who is a public charge? The term is an archaic one. It pre-dates federal immigration law and was typically used in the 1800s to refer to someone (regardless of their citizenship or immigration status) who was a “charge” of the state. In short, someone the government had taken charge of — typically in an almshouse — in a sense roughly akin to being a ward under the control and care of the government. The power to deny entry to immigrants who were deemed likely to become public charges was first added to federal immigration law in 1882, a few months before the adoption of the Chinese Exclusion Act. As immigration historian Hidetaka Hirota documents in a timely new book, the origins of federal immigration law denying entry on public-charge grounds were in cultural and class prejudice, particularly against Irish immigrants. Journalists and other public figures often claim that only the rich pay taxes, supporting this with the argument that the rich pay the vast majority of federal income taxes. However, federal income taxes are just one part of the broader tax code. When we consider other types of federal taxes as well as state and local taxes, it becomes clear that the overall tax code isn’t extremely progressive – in other words, it doesn’t “soak the rich,” and it certainly doesn’t let the poor off the hook. In fiscal year 2013 – the last year for which we have full federal, state, and local data – the federal government raised over $2.6 trillion in total tax revenue. It also raised an additional $134 billion in funds from other sources, most notably customs duties, remittances from the Federal Reserve, and miscellaneous fees and fines. About $1.3 trillion of revenue came from the progressive federal income tax, while another $274 billion came from the progressive corporate profits tax. Estate and gift taxes, which are also progressive, accounted for $19 billion, equivalent to just 0.7 percent of federal tax revenue. When people pay their insurance premiums every year, they are hoping that those premiums will cover future expenses. Specifically, that their health insurance companies will cover their bills if they fall ill, their car insurance companies will cover their bills if they get into an accident, etc. While any one individual may pay more or less in premiums than they receive in benefits, the insured population as a whole should generally break even. However, there is one avenue through which the entire insured population can lose out: overhead costs. Higher overhead costs leave consumers paying more in premiums even when they aren’t receiving more in benefits. In this sense, insurance companies with high overhead costs are similar to expensive middlemen.